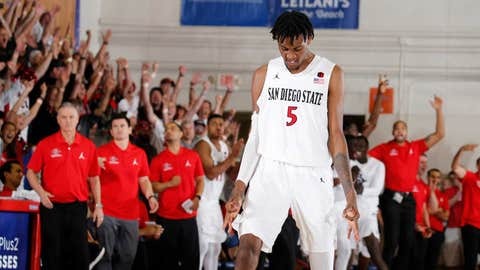 SAN DIEGO — The San Diego State Aztecs (3-2) return home Tuesday night to take on the Jackson State Tigers (1-5) at Viejas Arena. The game will air live at 7:30 p.m. on FOX Sports San Diego and the FOX Sports App. The Aztecs have won eight consecutive home games and are 16-2 in their last 18 home games played at Viejas Arena. The Aztecs are coming off a 1-2 appearance in the Maui Jim Maui Invitational, where they lost to No. 1 ranked Duke and unranked Iowa State. Guard Devin Watson leads the Aztecs in scoring through five games with 15.6 points per game, with forward Jalen McDaniels not far behind at 15.2 points per game. McDaniels also leads SDSU in rebounds per game (7.6). Catch all of the action live on FOX Sports San Diego Tuesday night.